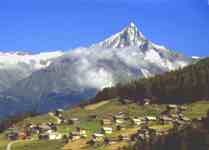 Getting There: Saas-Fee is in southern Switzerland and the gateway airports are Geneva and Zurich. Airlines that service both cities include Delta, Swissair, United, Northwest, KLM, Lufthansa, Scandinavian, British Airways and Air France. The 1-800 telephone numbers and Web links are listed in this magazine's Airlines page. International rail connections link up at Brig or Visp for the hourly buses marked "Saas-Fee." If you drive, we recommend you rent a car from the United States before traveling. 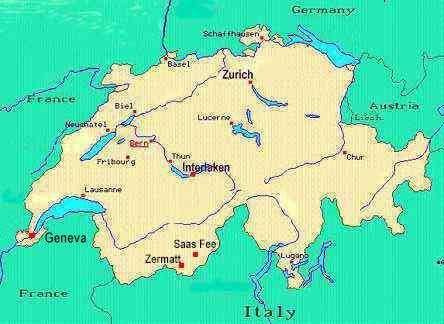 Most major car rental agencies service the Geneva Airport. The 1-800 telephone numbers and Web links are listed in this magazine's Autos page. By auto from Geneva, drive east toward Montreaux (N-5), south through Martigny (N-9), east through Sion, and turn off at Visp. Continue to Stalden and to Saas-Fee, where you must park at the edge of town in the multi-story car park or in the lot at the entrance to the village. Saas-Fee is closed to car traffic. Staying There: Saas-Fee offers 2,500 beds in 56 hotels and 4,700 beds in holiday apartments and chalets. Very helpful assistance is provided by the Saas-Fee Tourism Office, CH-3906, Saas-Fee, Switzerland; telephone 41-027-958 18 58; fax 41-027-958 18 60, or check out the Web sites listed below. Information about guided climbs, hikes, Wander Passes and summer skiing-snowboarding is also available. The village has 60 restaurants, 10 bars-pubs and four clubs-discos. Recommended guidebooks include: Walking Switzerland: The Swiss Way, by Marcia and Philip Lieberman; Walking in Switzerland: Lonely Planet Walking Guide; and Rick Steves' Germany, Austria and Switzerland. Swiss Federal Railways: On-Line timetable. A recent High On Adventure article by Lee Juillerat.